LED Corn bulbs are the latest in 360-degree, LED area lighting technology. They're called 'corn lights' because of the ear-of-corn look to the strips of LEDs surrounding the bulb, not because of the color. Important - we note actual lumens emitted. Some companies note their chip lumens instead of the actual lumens emitted, but the lumens lost due to the light's cover are unaccounted for with that method. Don't be fooled by other old technology. Our lights are made in 2018 with the newest tech, verified by the date code on the box. Silicon Valley got its name from computer chips. LEDs, or light emitting diodes, aren't just "like" computer chips, they are computer chips. They're silicon injected with specific impurities to light up when a voltage is applied, and Silicon Valley perfected them. When you want the latest led tech wizardry, it's our EverWatt lab coat nerds that are committed to building lights that exceed tomorrow's standards, and nerding out about lumen efficacy during their lunch break. BRIGHT LIGHT, BRIGHT SAVINGS - Corn light bulbs have universal applications and can save up to 81.6% on electricity consumption when compared to the HPS/HID/HALIDE/INCANDESCENT/CFL lights and fixtures they are replacing. Designed for better cooling with larger size aluminum heat sink and built in fan to ensure long life performance. EASY INSTALLATION - Bulb comes in 4000k, 5000k, 6000k light temperatures, and has an E26 standard screw base, making it a super easy LED retrofit and incandescent/metal-halide replacement. In most cases, just screw in. In others, since LEDs use a driver and not a ballast, you must bypass the ballast (Halide and other bulb types). Consult your electrician. 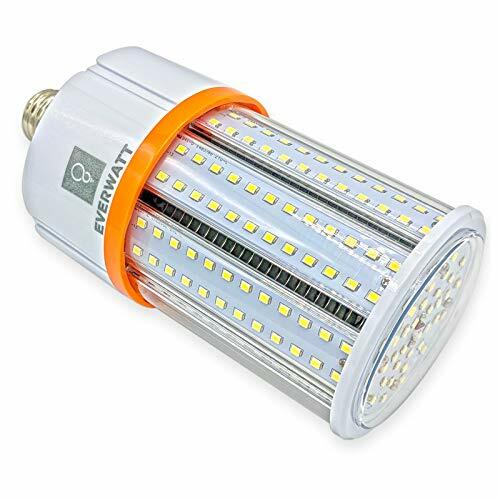 LATEST TECHNOLOGY, LONG LIFE - Our E26 standard base LED corn light style retrofit bulbs are made in 2018 with the newest tech, verified by the date code on the box. Uses LED SMD2835 Technology to obtain 115-150 lumens per watt and project light in a 360-degree fashion. Bulb is rated to last 23 years assuming 6 hours of usage per day. QUALITY ASSURED - Our 5-year unlimited warranty has your back. Contact us for quick and fast light replacements. UL LISTED and DLC CERTIFIED - UL listed for enclosed and non-enclosed fixtures (see technical details), and equipped with autosensing and rated for 110V-277V AC, DLC certified for rebate and incentive programs from numerous utilities, cities and states, nationwide. If you have any questions about this product by EverWatt, contact us by completing and submitting the form below. If you are looking for a specif part number, please include it with your message.